Along with these, he also shared some useful tips on how to boost memory recall of learners. Jay also shared that research shows you tend to forget almost 50 - 80% of what you learn if you don’t revisit it within 24 hours of learning. To bridge this gap between learning and retaining, these techniques help achieve the objective of boosting knowledge retention. These techniques basically comprise of processes by which long term memory preserves learning so that it can locate, identify and retrieve it in the future. Some of them include the use of acronyms, melody and rhyme (just like we all did while learning alphabets) and visualization by way of creating an association between the information. For learners to increase their knowledge retention it is important that they learn in an environment which is spontaneous and which makes them put theory into practice. In other words, learning from experiences and conversations, forms an integral part of any learning process. This is where informal and experiential forms of learning come into picture. In addition to this, practices like drawing mind maps to make connections visible, go a long way in making life simple and easy for a learner. For a better understanding on how to use these techniques in learning, Raptivity demonstrated a variety of its unique interactions that aid the purpose of ‘Making Learning Stick’. Well, this was not all. 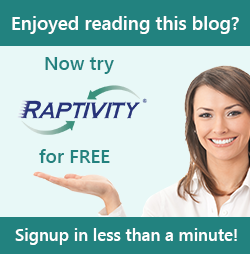 Raptivity also rolled-out a free license of Raptivity Essential to a lucky winner called Michele Pluta. To avail the recording of this webinar click here. Last but not the least, to help you all understand the techniques and concepts explained in the webinar in detail, I would be posting a blog every Thursday that will explain each of these techniques/concepts elaborately.